I was in a charity shop today stocking up on books when I saw something amazing. 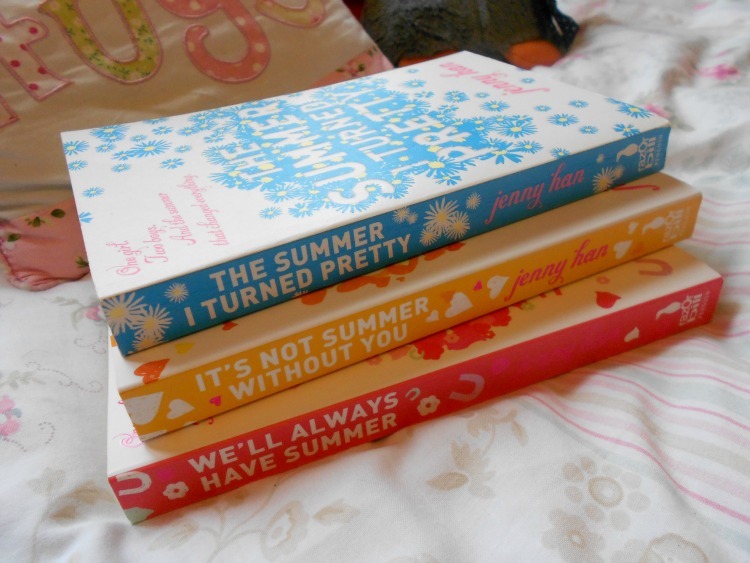 (It was so amazing I actually squealed a little bit in the middle of the shop...) The Summer trilogy by Jenny Han! :D If you've been reading my Summer Reads posts (here and here) then you'll know about my love for these books, and you will have read my little reviews in my last post. So when I saw these books I knew I had to buy them. They're in great condition, so I decided to keep them for myself and put my old copies (which are in even better condition) on here for you guys to win! Like I said before, these books are second hand as they are my copies, but I take great care of my books. They've been loved and I even hugged them a couple of times...The spines are slightly creased as I've read them for the past few summers, but apart from that they are in lovely condition. My favourite summer read is probably Girl Missing and the rest of the trilogy... Hmm... I haven't read them in ages, I should!! Hey on the blogging about it one, does it count if I just mention it? Does it have to be a whole post? I've never really read any chick-lit/contemporary books over previous summers but I'm starting to now! I'd say Me, Suzy P. is a good summer read! I do tend to reread HP over the summer too, haha!